It was a Monday morning in Hillman City, a quaint Seattle neighborhood outfitted with locally-owned shops and businesses. The air was mild and wind, brisk. On the corner of Rainier Ave S and Orcas St. sits the Hillman City Collaboratory, a brick-faced social change incubator that provides space and programs designed to create a sense of community and equip change-makers. I made my way to the kitchen to find Chef Tarik "Chef T" Abdullah, a Seattle native and culinary force, bobbing his head to the mellow grooves of Jessie Boykins, Jr. as he pushes a mop back and forth to the beat. He greets me with a smile. On the table, he's got a couple trays of peaches that were donated by a local grocer. To the left, a dry erase board with a pie recipe and ingredients listed for the day's class. He glances at the clock and realizes his students will begin to arrive soon. Abdullah teaches a culinary summer camp called "In the Kitchen with Chef T," which gives 10 kids ages 6-13 an opportunity to learn the basic fundamentals of cooking, food justice, teamwork and more. The first of the little chefs arrives eager to get started. He unhooks an apron as he walks over to Chef T, who quickly puts him to work dicing peaches for the day's lesson on baking pies. The little guy's demeanor was that of an experienced sous chef, as he navigated the kitchen with the type of confidence that'd lead you to believe he lived there. Chef Aimee Graham, a gifted pastry chef who excels at a few local restaurants, arrived shortly after to teach the day's pie-making lesson. Once all the little cooks had wandered in, Chef T informed the class that Chef Aimee would be in charge and started the day with an official toast (with water of course). Chef Tarik Abdullah had begun teaching cooking classes for kids about 15 years ago, after realizing he wanted to give back and find his true calling. He found the Collaboratory space shortly after moving back to Hillman City. Chef Tarik hosted the first run of culinary classes this past spring, and after its success, decided to expand the Saturday morning classes to a three-day summer camp. The classes are 100% free for the children, which is made possible by a grant Abdullah received and donations from local stores like PCC Natural Markets. He volunteers his time without compensation, and has definitely got the support of the community. It's not hard to understand why either. The tenured chef has got an inviting charm and charisma, both in and outside of the kitchen. His heart for the kids and the culinary arts beams throughout the classroom and local scene. It was easy to get lost in time as I watched these young cooks work. They took so much pride in the process, meticulously creating their pastries as if they were born in kitchens instead of hospitals. Chef T and Chef Aimee provided guidance and support when necessary, but the kids held their own and were eager to build their creations independently. 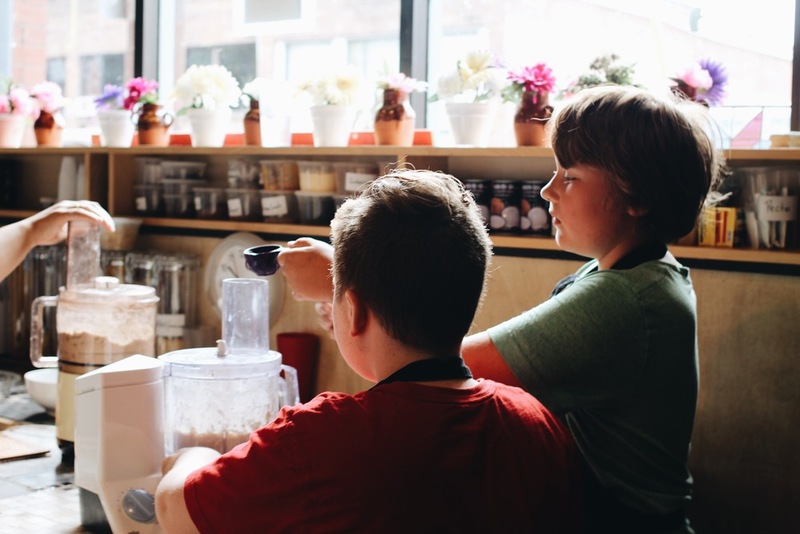 The most rewarding thing about this experience was watching the little chefs absorb what they'd been learning all summer, and really develop a passion for the kitchen. The vibe was light-hearted and the energy was high, especially among the boys. Chef T encourages his little proteges to take full ownership of their dishes during the classes. He's the most charming disciplinarian I've ever met, as he requires the junior chefs to maintain clean work stations, respect their peers, and clean the kitchen as a team once the dishes are finished and the day is coming to a close. The amount of attention to detail these little guys paid to their pies was incredible. There were several moments when I forgot I was actually watching children cook and not seasoned chefs. It's amazing how powerful exposure can be, and how far children can take that inspiration and expanded outlook on what defines a career. Although his mission was simple, to get and keep kids off the streets, Chef Tarik Abdullah's influence will surely stretch far beyond these classes. He's introduced his students to a world of possibility beyond their comfort zones, current realities and ethnic and economic backgrounds. That's the most beautiful thing about investing time into working with children. It's an investment that will continue to grow, long after the time spent has passed. Chef Tarik plans to continue the "In the Kitchen with Chef T" classes at the Hillman City Collaboratory for as long as he can. To learn more about the courses, visit his blog, "A DJ and a Cook."